Colombo, the world's tallest Christmas tree “symbol of unity"
AsiaNews Report: The project by a Buddhist group is listed in the Guinness World Records. The artificial tree measures 72.1 metres and cost almost US$ 72,000. For the prime minister, “although Sri Lanka is a predominantly Buddhist country, it has shown the world that all religions". 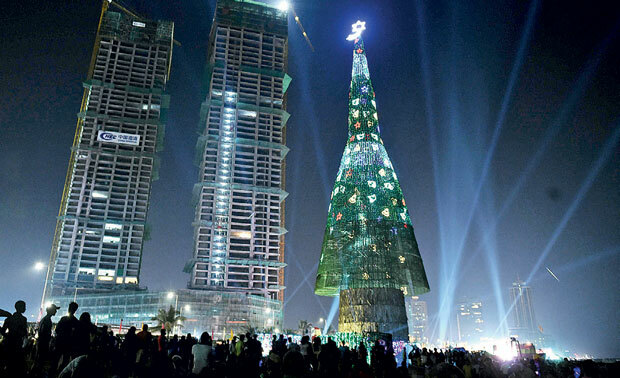 Colombo (AsiaNews) – The Christmas tree built last year on the Galle Face Green in Colombo has been included in the Guinness World Records as the tallest artificial tree in the world. On 13 December Arjuna Ranatunga, minister of Ports and Fisheries and one of the major backers of the initiative, presented the certificate to Sri Lankan Prime Minister Ranil Wickremasinghe. The latter in turn thanked "all people, regardless of religious differences, who made the tallest Christmas tree in the world possible. It stands out as a symbol of peace and unity." Last year the construction of the 72.1-metre tree was very controversial, especially for the leaders of the local Catholic Church, who described it as a waste of money. The event was backed however by a group of Buddhists, led by the Foundation of Social Services of Minister Ranatunga, a former captain of the Sri Lankan cricket team. During the award ceremony, Prime Minister Wickremasinghe stressed that "although Sri Lanka is a predominantly Buddhist country, it has shown the world that all religions are respected the same way". He then praised the group that built the tree for their "tireless work and commitment to establishing this world record". The tree was lit on 23 December 2016 until 31 December. Its main frame was made of metal cables, covered with bark and natural pine cones. The project cost 11 million rupees (almost US$ 72,000). Its creator, Mahinda Nanayakkara, a Buddhist, told AsiaNews that he was “happy to have put the name of my country in the Guinness World Record, thanks to my capacity for innovation and team spirit."